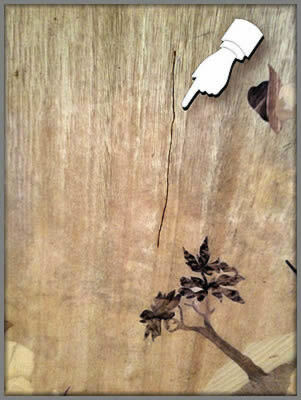 November's update brings you a Buchschmid and Gretaux wood inlay table. These tables are a very much admired example of Buchschmid and Gretaux's wood inlay skills and are naturally rather sought after. However, due to their age and their existence in a normal domestic environment, wear, tear and damage can and does occur, so what can be done about it? Hopefully November's Buchschmid and Gretaux feature will answer some of those questions for you. 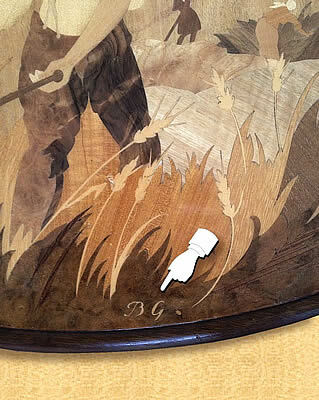 Our November update brings you an interesting example of a Buchschmid and Gretaux wood inlay table. 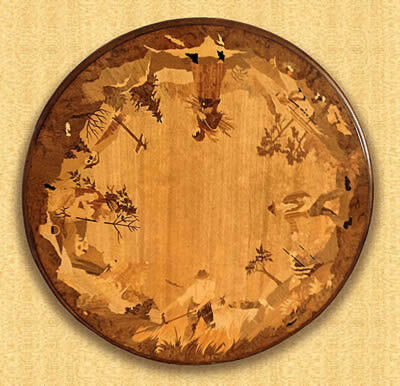 This table, property of "Susie Smith", features the much admired Four Seasons theme. Although basically in very good condition, the table has acquired two small blemishes in its near half century of existence. You can see the blemishes in the two lower photos. We have enhanced the blemishes in order to show them more clearly, in reality they are much less noticeable. The owner, Susie, has asked us what should be done about them. Well, in our opinion we would say, if you wish to retain market value for the table, then leave it as it is, don't do any restoration work on it. If the blemish or damage is slight, it is best to leave the piece in as original condition as possible. Collectors will accept blemishes or damage gained naturally as normal wear and tear which would reflect the tables (or pieces') age and use. Half a century of life will inevitably acquire some signs of its use in a family environment. Unless the table was stored away in an environmental stable glass display case, there's no real way of avoiding a little real life distress. The only time we would really recommend full restoration is when the varnish has cracked so badly that moisture has got in and under the varnish and is starting to lift the veneer and causing pieces to literally come away from the surface. Also, if a bleaching effect is starting to occur because of the veneers lifting, then this would be a very good reason to halt the damage and seek professional help to prevent any more damage and restore the table to as near original condition as possible. 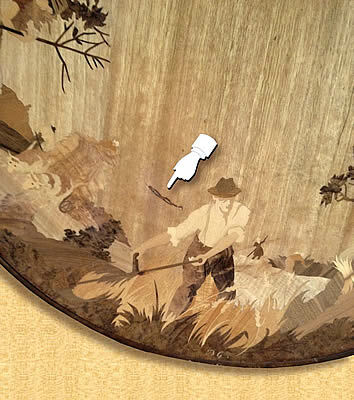 Small damage such as you see in these photos (the damage has been enhanced so that you can see it clearly) should be checked to make sure that it hasn't gone through to the veneer beneath. If it has left the veneer surface open to the environment, then it would be a good policy to provide a little seal against moisture getting in to the veneer and causing it to absorb the moisture and creating further distress by swelling and thereby causing further cracking of the varnish. A little wax polish rubbed over the scratch or crack so that it can act as a barrier against moisture should be all that is required to remedy potential further damage occurring in these 'fault lines'. Preferably one of the solid style of wax polishes would be best for this job, the spray ones have too many additives to do the job properly. Just a smear of wax should be sufficient to act as a barrier. Click the above button to return to page 57 of "Can You Help"